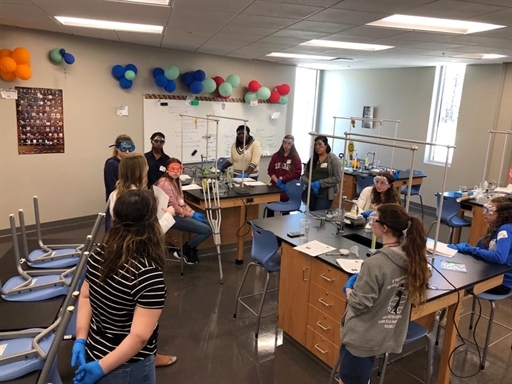 On March 29, 2019, students from Alcovy High School came to Agnes Scott College and spent the day attending classes, touring the campus, and participating in different STEM activities with ASC faculty and students. The 20 high school students in attendance were members of the “Gifted Girls” group at Alcovy. The Agnes Scott students who organized the day are representatives of the Generating Excellence in Math and Science (GEMS) living and learning community. This annual event was established by an Agnes Scott College alum to give students from her alma mater the chance to experience STEM resources not available to them otherwise. For the WIB sponsored activity, students learned about green chemistry and renewable feedstock resources. Students used a plastic cup made from poly-lactic acid and performed base hydrolysis to break the polymer down into lactic acid monomers. The solution was then neutralized and can now be used as a safe, sustainable, household cleaning product. Students were able to bottle the cleaning product and take it home. 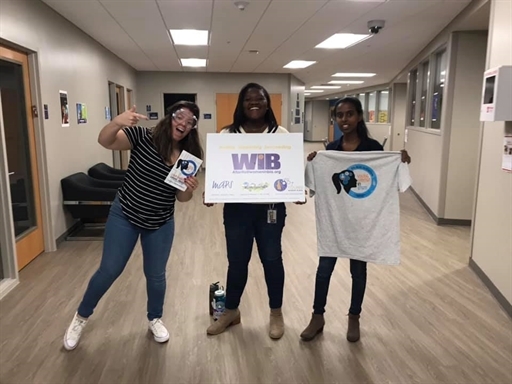 Students from both Alcovy and Agnes Scott showed significant interest in learning about the WIB organization and the GEMS were thrilled to have a national organization backing their event as a co-sponsor. The group picture shows students holding cups, cleaning products and the blue WIB keychains, and many are wearing their WIB pins. On March 23rd, YWIB Atlanta was thrilled to return to the Atlanta Science Festival’s Exploration Expo! 22 volunteers (both WIB Atlanta chapter members and undergraduate students from Agnes Scott College) facilitated the activities at the YWIB booth for an estimated 400 visitors.The culminating event of the two-week festival, the Exploration Expo was a free event that drew over 25,000 people to Piedmont Park in downtown Atlanta for a fun-filled day. The Expo featured over 100 interactive activities and performances celebrating the excitement, diversity, and influence of science, technology, engineering and mathematics in Atlanta. To celebrate Women’s History Month, the Atlanta chapter hosted a booth that showcased demonstrations corresponding to famous women in the history science. In honor of naturalist and illustrator Maria Sibylla Merian (1647-1717), visitors to the booth in the morning dissected flowers in order to discover the flowers’ anatomy and how each part contributes to reproduction. Afternoon visitors had the opportunity to extract DNA from strawberries in honor of Rosalind Franklin (1920-1958), whose contributions to the discovery of the molecular structure of DNA paved the way for today’s study of genetics. Visitors were able to learn more about these influential women through discussions with volunteers and handouts to take home. This was a phenomenal event and we hope to return next year! On Sunday March 17th, representatives from YWIB Atlanta attended the first ever Young Women In STEM Fair at the Atlanta Jewish Academy. This event was designed to expose female high school students and 8th graders from across the metro Atlanta area to a wide variety of educational and career paths in STEM, connect the girls with women in STEM fields, and help the girls connect with their peers with similar interests. The event included a keynote address by Dr. Lori Zeltser from Columbia University, numerous booths representing places like the CDC and Georgia Department of Public Health (and Women in Bio, of course J) to provide the participants with opportunities to meet women who have careers in STEM fields, and break-out sessions meant to give the students a hands-on STEM experience or learn more about a specific topic. YWIB Atlanta volunteers, along with a handful of Agnes Scott College student volunteers, spoke with the young participants who visited the WIB booth to discuss their current interests and future ambitions as well as the volunteers’ own careers or studies in STEM and answer the students’ questions. 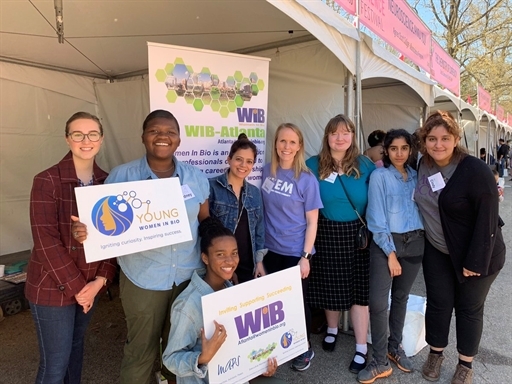 The students’ interests were varied – from rheumatology to writing – and the WIB and Agnes Scott volunteers were delighted to engage with them and hopefully inspire them to continue exploring the innumerable options available in STEM. Meanwhile, the break-out sessions were arranged similar to a conference, with the students choosing which of the handful of sessions to attend. YWIB Atlanta facilitated a breakout session titled “From Cups to Cleaner” which focused on green chemistry which had a great turnout. Students were introduced to the 12 principles of green chemistry, learned about renewable resources such as the biodegradable polymer polylactic acid (PLA), and used a simple base hydrolysis to convert a PLA plastic cup into a household cleaning product. Agnes Scott College student volunteers helped WIB volunteers facilitate the “From Cups to Cleaner” session, which also gave the high school students a unique opportunity to connect with women just a bit older than them pursuing STEM majors while they waited for the reaction to complete. Both the high school students and the Agnes Scott College students enjoyed and benefited from the experience – a resounding success! 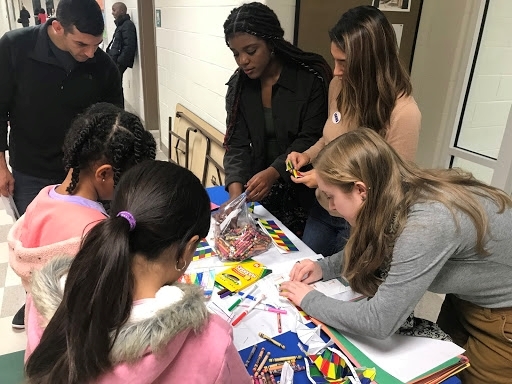 On December 4, 2018, YWIB-Atlanta was excited to return to the annual Sarah Smith Elementary STEM Night. YWIB-Atlanta volunteers enjoyed talking with over 400 students and parents about DNA. Students participated in various activities with the YWIB volunteers including coloring a picture of a cell, learning about organelles, creating 3D DNA origami and performing DNA extraction from strawberries! YWIB-Atlanta is extremely thankful for the Agnes Scott College student volunteers.